This is one of those loaves that was interesting to make, but now that I have made it I don't think I will make it again. Marbling the loaves made for a splashy presentation but the extra work is not worth it for everyday baking. Maybe I will revisit this one when I need to impress someone. 1. The bread is not overly "rye-y" since the rye flour is in a 1:3 ratio with bread flour. This is perfect for those who aren't that crazy about rye, but will disappoint others who like lots of rye flavour. 2. I skipped the caraway seeds because I hate them. 3. 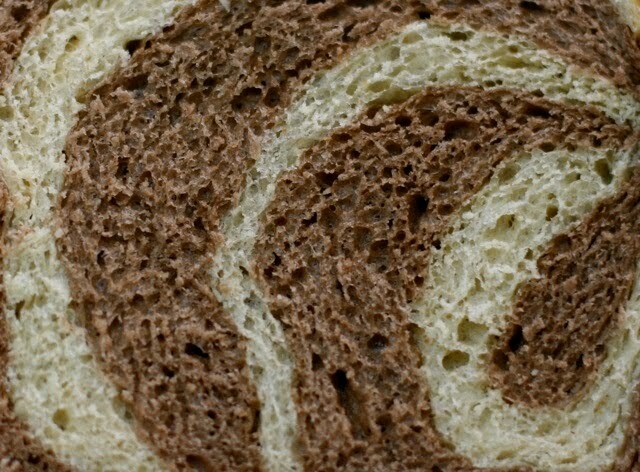 I coloured the dark rye with cocoa powder. The downside of this is that it tricks your brain into thinking you are making some desert loaf. 1. I did not bother subbing the egg wash with soy milk.